I can’t believe summer break is almost over and kids will be back in school in a few weeks. Are you looking forward to them going back to school? Or are you dreading all the pickups and drop offs from school, piano, soccer, etc? I totally get how crazy these after school activities can get. Picking the kids up from school, getting them fed and rushing from one activity to the next can be a little overwhelming at times. That’s why I figured we need after school snacks that are not only delicious but quick and easy to get on the table. I usually default to fruits and smoothies but then this year, my two kids ganged up on me. They shared how much they ‘loved’ my smoothies but we needed to try something more exciting. Ahem.. I realized that my talk on “Always try something new”.. “Challenge yourself this school year” had come back to bite me. Not one to give up on a challenge, I started to look for inspiration in magazines, cookbooks and one of my favorite grocery stores – Costco. On one such visit to Costco, my 10-year old daughter spotted tortillas in the refrigerated section and got really excited. She said, “How about we make cheese quesadillas for after school snacks?” My kids are big fans of cheese quesadillas and can’t get enough of them. Like, seriously. 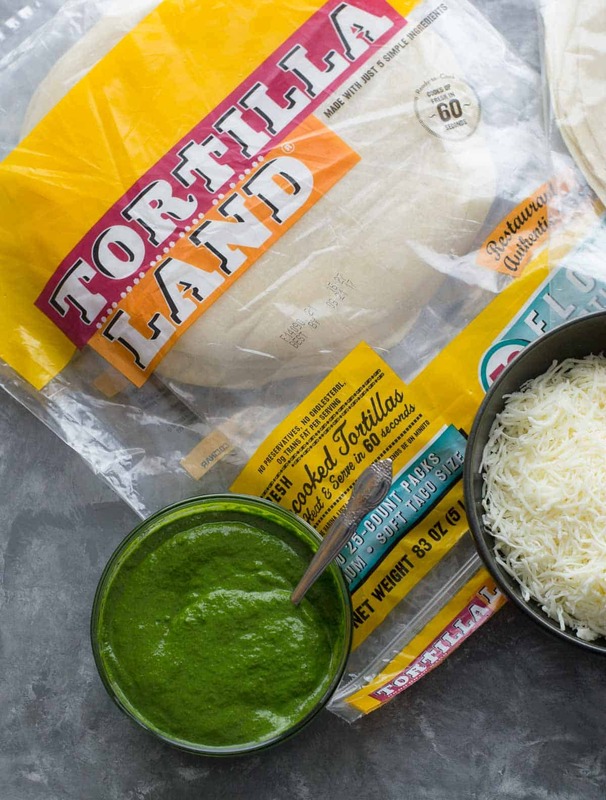 I picked up the packet of tortillas – it read TortillaLandⓇ 50-count uncooked flour tortillas. What piqued my interest was that it had ONLY 5 ingredients and they were all recognizable. YAY! Plus it cooked in 60 seconds.It was perfect!! Before I could even place the tortillas in the cart, the request for cheese quesadillas came in :). 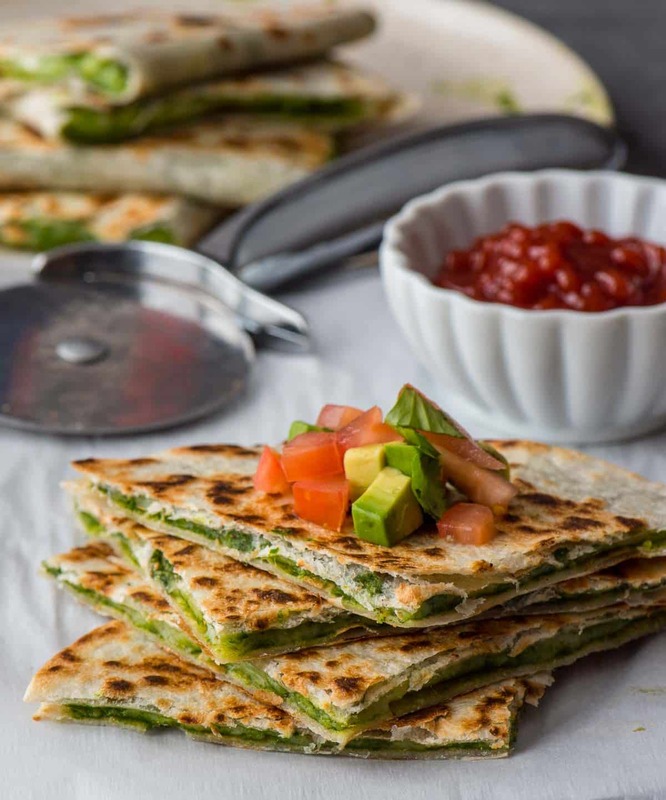 But as we were driving home, I thought while cheese quesadillas sounded lovely, I wondered if I could switch things a bit.. maybe give it an Indian twist with some green chutney, veggies and of course some cheese. 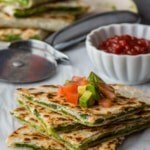 Out of the endless possibilities that ran through my head, I am sharing the two recipes that I shortlisted and made – chutney cheese quesadilla and mini veggie tortilla rolls. Both were a big hit with my family and if you make the chutney in advance, these recipes could be put together in a cinch. Hope you enjoy making and eating them just like I did. Here’s a video that will show you how quickly you can put together a chutney cheese quesadilla. Do a taste test and add more lemon juice, salt, and sugar as needed to get the balance of flavors you are looking for. In a pan set over medium heat, cook the tortillas until just golden on either side. Set them aside. Place one cooked tortilla on the pan and spread a layer of green chutney over it and generously sprinkle cheese over it. Place another tortilla on top. Cook for a minute or two over medium heat until the cheese has melted. Repeat the process for the remaining batch. Cut into quarters, serve with ketchup and enjoy! In a frying pan set over medium heat, cook the tortillas until just golden on either side. Set them aside. 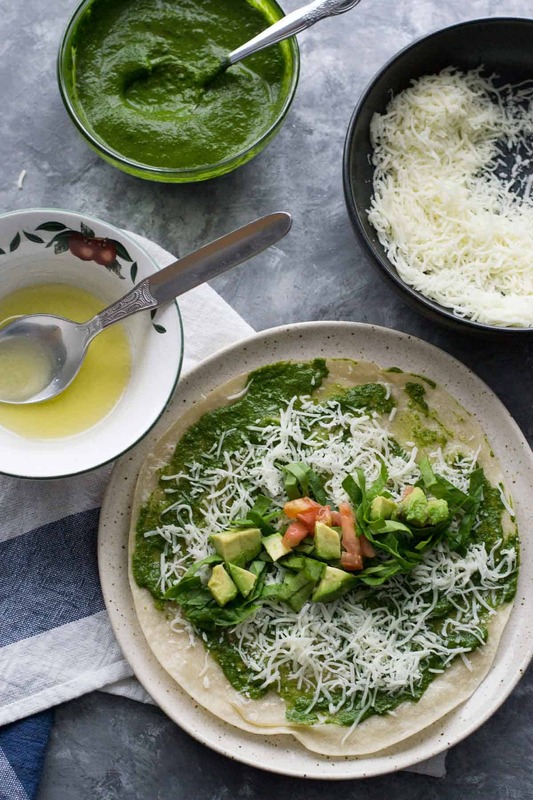 Place one cooked tortilla on a plate and spread a layer of butter over it followed by green chutney and then generously sprinkle cheese over it. Layer it with chopped veggies and roll it like a burrito. Set the same frying pan on medium heat and add a teaspoon of butter. Place the rolled burrito and cook for 2-3 minutes over medium heat till the cheese has melted. Cut into half, serve with ketchup and enjoy! I just found your blog and everything looks amazing! 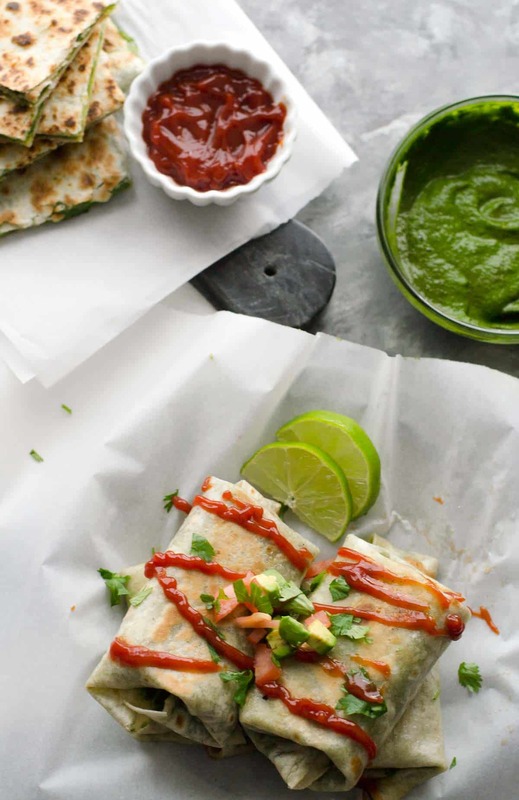 I showed this recipe to my husband, and he wants your chutney quesadillas as soon as possible. I’ll be getting cilantro tomorrow morning! Thank you for so many wonderful new recipes! Deena – thanks for stopping by and for your lovely comment. Would love to hear from you on how the recipe turned out.